If you are like me, you’re no stranger to crocheting hats. They are my go-to project in many situations because they require little time and yarn to complete. In my experience, they are perfect for that one skein of amazing yarn I picked up at a yarn store on vacation. Special yarn or not, you will make many hats on your crochet journey. Sometimes you will have the “model” available to try on as you crochet, other times (most often) you will not. The concepts I’m about to share with you are the result of years of trial and frogging. If I can eliminate some of the guess work and headache, I’m all for it! I’m happy to share my personal tips of how to size a crochet hat. Before we get into the details of how to size a crochet hat, we must first address the fact that there are two distinct ways to crochet hats. Method 1: Crocheting in the round, from crown to base (top down method). Method 2: Crocheting in the round, from band to crown (bottom up method). Both methods are quite popular. You may have even encountered a pattern or two using either of these methods. If I’m working with a true beginner who wants to crochet a hat, I typically introduce them to method 2 first. I find this method easier because you do not have to worry about increasing properly (or at all). For the beginner looking to advance their crochet skills, I introduce them to method 1. This way they learn how to crochet a circle but have a project, an end goal in mind. Okay, now let’s get back on track. There are two important measurements when sizing a crochet hat, head circumference and hat length. Both measurements are important no matter which method, 1 or 2, you are using. Head Circumference: wrap the tape measure around the head, resting it in the middle of the forehead. Hat Length: place the end of the tape measure on the top, center of the head and run it down the side to the base of the ear. I have my measurements and I want to make a hat with method 2, now what? Let’s say you are crocheting a hat using method 2 and you took your own measurements just as I suggested above. Great! Since method 2 requires that we crochet the hat from the bottom up, we are going to focus on the circumference measurement first. We will begin our hat (using method 2) by making a chain that is the same length as our circumference. Keep in mind that some stitches require specific multiples and we need to adjust the number of chains accordingly. But that is another topic for a different post! Once your chain is the same length as your circumference, simply join with a slip stitch to the first chain to form a large ring. Now your hat will be the proper circumference! We also need to address the length (still using method 2). Think of crocheting a hat using method 2 as a tube. You will crochet around and around until your hat matches your length measurement. Closing up the crown of the hat is as simple as creating a drawstring bind off, but we need to keep in mind that doing so will cause us to lose a little length. The amount is dependent on a few different things (such as gauge, yarn, hook etc) but a good rule of thumb is to crochet your hat one inch longer than it needs to be. This should compensate for the closure and your hat will keep your ears warm too. Now lets address the situation when you are using method 1 and you took your own measurements. Since method 1 requires that we crochet from the top down, we need to do a little more work to get the sizing just right. I hate to say it, but if you took your own measurements, you will need to do a little calculation. Don’t worry though, it’s easy! For those of you who enjoy math, you’ll appreciate that we are solving for d in the familiar circumference of a circle calculation. Just to clarify, the diameter (6.69″ in the above example) is the length from one side of your circle to the other. When doing this calculation, you will often come up with a number that is not “friendly” such as the above example, 6.69″. When I calculate a number that doesn’t translate (easily) to a line on my tape measure, I simply do a bit of rounding. In this case, I would round up to 6.75″. Now how about the length when using method 1? If you’ve made it this far and you are still with me, this last part will be a breeze. Once your crown (starting circle) is the proper size according to your measurements and calculation you will stop increasing and continue your rounds without adding extra stitches. After a few rounds, you will notice the sides of the hat begin to form. When you’ve made several rounds without increasing, measure your progress and stop when you have reached the your length measurement. Chances are though, you will not have the recipient available to measure. So what do you do now? I have organized a chart containing the average head size, ages preemie to adult large. This chart is tried and true. I use it every single time I make a crochet hat. Okay great, but how do I use this chart based on the method I am using? Here’s where I take this lesson to the next level. 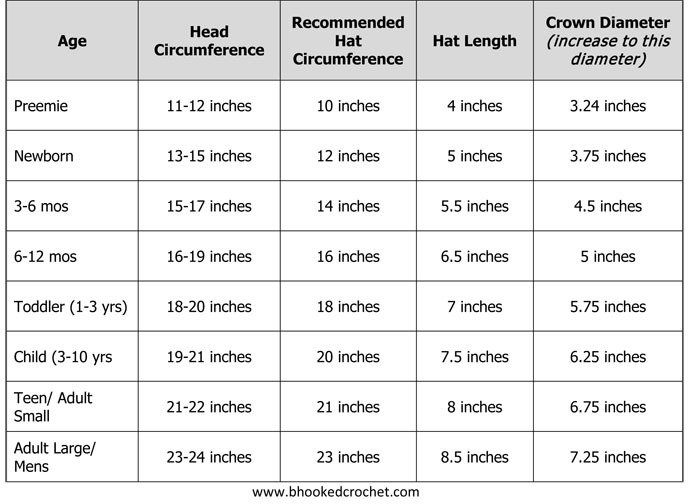 There are several hat sizing charts floating around the web, but it is assumed you know how to use them. That’s an unfair assumption in my opinion. Yes, many of you seasoned crocheters will completely understand these concepts. If this is you, scroll down to the next section. I want to completely break this down so anyone can figure out how to properly size their crochet hats, no matter what level of crochet they fit into. Let’s first talk about why “head circumference” and “recommended hat circumference” are different numbers. When I put on a winter hat, I expect that it will stretch as I put it on so that it will keep my head snug and warm. The reason these two columns have slightly different measurements is for this exact reason. We want the hat to stretch a bit as it is put on so that it stays snuggly in place. I have had a few crochet hat blunders in my day. My favorite though is when I’ve finished my hat, put it on my head and it sunk down right to my eye lids. No fun, trust me. Whether you are using method 1 or method 2, you always want to make the circumference of your hat equal to the “recommended hat circumference” column. But just in case, allow me to clarify again, that the actual hat length for method 2 needs to be approximately an inch longer than what is listed in the column. This will account for the drawstring closure and make sure the hat length is still correct. Let me elaborate a bit by saying the “hat length” column lists the hat length when complete. What’s the deal with “crown diameter”? This column applies to those making a hat using method 1. When we start a hat using this method, we start off with a circle, stop increasing and then the sides magically begin to form. Depending on the size hat that you are making, whether it be for an infant or your teenage daughter, you want to crochet your starting circle to equal the diameter listed in the chart. Let’s say you are making a hat for your teenage daughter using method 1 as a surprise. You don’t want to take measurements because you fear it will ruin the surprise. So you refer back to the chart above. You notice that the last column, “crown diameter” says 6.75 inches. Now what? In this example, you will begin your circle and crochet enough rounds until the circle diameter (length from one side to the other) measures 6.75″. Easy as that! Here is another example. 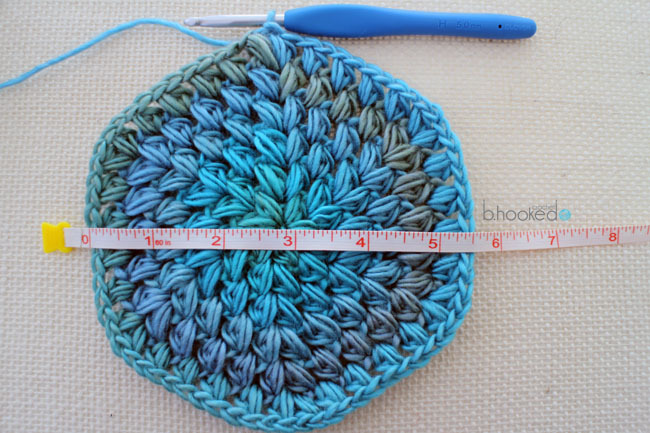 In this case, I am crocheting a hat for a toddler so I need my starting circle diameter to be approximately 5.75″. Pretty close! Crocheting a hat that fits takes a little preparation (as you have now seen by the length of this post), but it also takes a great deal of practice. There are other factors that come into play that I will discuss in greater detail in my upcoming eBook. My goal with this post was to (finally) create a resource that addresses those questions every beginner has in the back of their mind. In my opinion, it’s far easier to understand and remember a concept if you know the why behind it. Sure, a hat sizing chart is great and it gives you exactly the information you need to know (if you are a pro), but sometimes a chart simply isn’t enough. In true B.hooked Crochet fashion, I listened to you and gave you the information you need to succeed. Was this article helpful? I’d love to hear your thoughts in the comments below! Thank you so much for this very helpful article!!!!!! Now I’m gonna have tons of fun crocheting hats for my little girl and baby boy during this winter here in São Paulo/Brazil! One last question: what marvelous stich is this one in the picture of the circumference?? Regads and thanks a million. Comprehensive !~! Thanks so much. very helpful thank you! I’m following a My Boshi pattern and my crocheted circle looked so small, but now I’ve read your article, it’s actually about right lol. My first hat was a pretty big mess – too big and wobbly. You’ll get better with practice! Thanks so much for this article. I’m a hat newbie and this helped demystify the process for me. Very much appreciated! Does the yarn weight affect the measurements? I mean especially for the crown size, as you will need more rounds of increase if you use a lighter yarn..
That’s a very good point! Even though (you’re absolutely right) you need to make more rounds of increasing depending on the size yarn and hook you’re using, we are measuring the crown in terms of inches, not rounds. This makes it applicable to whatever yarn or hook you’re using. Pretty nifty trick! Thank you so very much for sharing this information. I have a friend as well as myself, both have small heads when it comes to hats. Your information will help to make her a hat for Christmas that won’t be too large for her head. It never fails I make it according to the directions and it is to big and doesn’t look correct. Although I can’t take her measurements, I can do mine and use my size to fit her. Agai thank you for sharing, this article has been very helpful to me. I’m sure any other readers out there will also find it to be beneficial in the future.